By making a monetary donation to Habitat for Humanity, you are investing in a family’s future! It is so much more than just a monetary offering to the families affected by the donation. Besides helping them escape unsafe, unhealthy living conditions, your donation also helps these families break the cycle of poverty and help build long-term financial security. With the Habitat’s affordable, no-profit house payments, money is then available for food, child care, medicine and other necessities. Research has shown that decent housing improves health, increase children’s educational achievement and strengthens community ties. With your support, Habitat for Humanity continues to change lives across the country and right here in our own community! All Fostoria Habitat for Humanity donations are tax-deductible as allowed by law and will be acknowledged with a letter you may use for those purposes. Gifts made be made safely online. Download this Fostoria Habitat Donations form to submit a payment by mail. 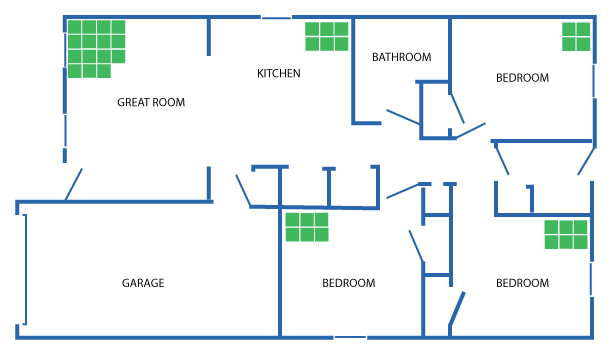 At right, is a typical Fostoria Habitat floor plan for a new build. Cost of a new build is approximately $75 per square foot.